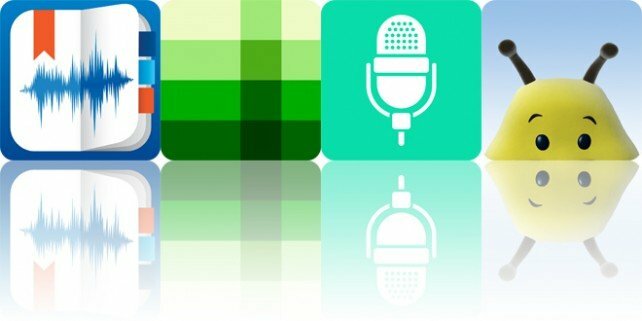 Active Voice : Instantly convert your speech to text (English + 34 other languages are fully supported). Don't type anymore. Just speak and you're done! - Tensift ($1.99 → Free, 5.5 MB): Use your voice to create bodies of text that can be shared and translated with Active Voice. It’s ideal for those who aren’t the best typists. Bumblz - Animated Series and Activities for Children and Toddlers - Playrific, Inc. ($3.99 → Free, 9.3 MB): A collection of puzzles, memory games, sing-alongs, and videos designed to delight children and help them learn. It’s great for any child that’s fond of the animated series. eXtra Voice Recorder: record, edit, take notes, and sync with Dropbox (Perfect for lectures or meetings) - Denys Yevenko ($2.99 → Free, 7.5 MB): This high quality audio recorder allows you to attach notes to lectures and meetings. It’s the perfect app for students and business professionals. Shades: A Simple Puzzle Game - UOVO ($1.99 → Free, 28.6 MB): Combine blocks to create and remove different shades in this unique puzzle game. It’s for casual gamers who want a zen-like puzzle experience.